For over 10 years, DJ Steele has been working with clients to create unique and tasteful entertainment experiences for their event guests. From start to finish, you can expect him to be reliable and professional so you can spend time enjoying your special day! Currently there are over 150,000 songs in our music library (increasing weekly). Anything from old to new, polka to hip hop, we likely have it. (If we don’t, we’ll get it for you!) We have a full lighting system, 2 wireless mics for your use, 1 sub, and 2 house speakers. 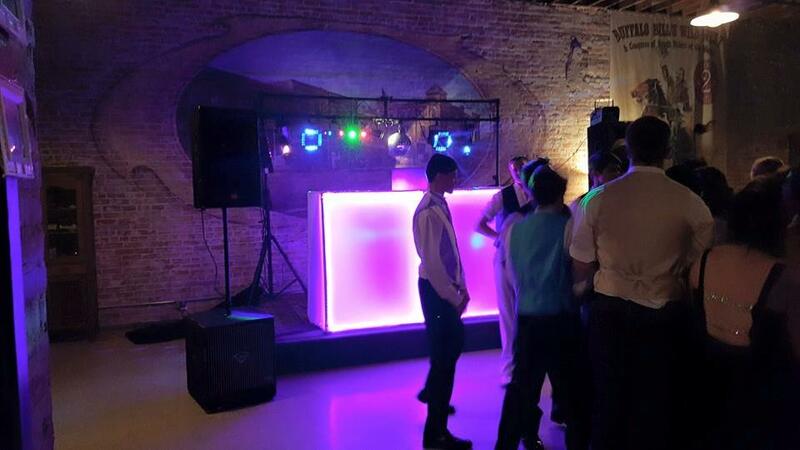 The DJ equipment is housed in an attractive, lighted “booth” to minimize the eyesore of cords and plugs. We offer customized monogram lighting for your event, at no extra charge.